East Shore Lodging on beautiful Lake Wallenpaupack is the ideal location for your next group gathering. 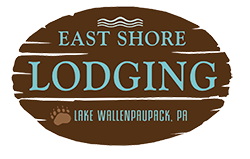 Located across the street from one of the best attractions in the Pocono Mountains, Lake Wallenpaupack, East Shore Lodging is a boutique motel style lodge featuring spacious, modern guest rooms and suites. Convenient on-site tour boat, gift shop, boat slips and boat rentals (pontoon boats, kayaks and stand up paddle boards). Each guest room has been decorated with a rustic or traditional flair and have modern conveniences such as a microwave, refrigerator, private bathroom, free Wi-Fi, flat screen cable television and complimentary continental breakfast each morning. East Shore Lodging is steps away from the lake and a 1.5-mile walking trail, beach, visitors center and Observation Dike.